They don’t eat much and they’re sculptures made from business cards. They’ve been ordered for managers at Longhorn Steakhouse. Need other ideas for the rancher or cowboy on your gift list? Click over to Stagecoach, Horse, Conestoga Wagon, Oil Well, Mining Ore Wagon or even the Patriot Eagle sculptures. 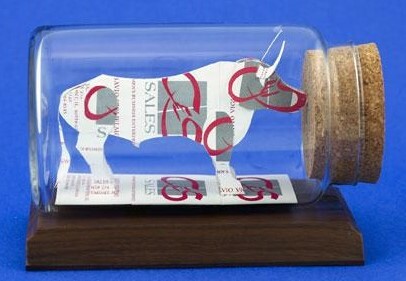 We have more than 60 business card sculptures under glass, including the popular Doctor and Golfer! They’re a great gift because they are personalized using the recipient’s business cards.